Follow Jade as she strays from the path of her Master's advice in search of a demon that can give her the power to free her people. Lost in the catacombs of the Jin-Wu temple Jade must overcome traps, puzzles and the devoted followers of the Serpent that ensure only the worthy are permitted. Will she succeed? What will happen if she does? 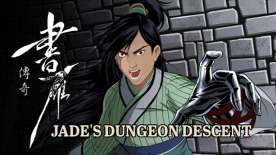 Jade's Dungeon Descent is also part of the highly rated Steam game Shuyan Saga, which was nominated for 2018 Best Original Interactive Production by the Academy of Canadian Cinema and Television. © 2018 Lofty Sky Entertainment Inc., a Lofty Sky Media Group company. All Rights Reserved.